Star Wars fans fortunate enough to make the trek to the “Star Wars Celebration” in Chicago were treated to the first teaser trailer for Stars Wars: Episode IX and the reveal of the film’s official title: Star Wars: The Rise of Skywalker. The new addition to the blockbuster sci-fi franchise will arrive in theaters on December 20, 2019. Stephen Colbert had the honor of hosting the panel discussion at the fan event, and he was joined on stage by cast members Daisy Ridley, John Boyega, Kelly Marie Tran, Oscar Isaac, Billy Dee Williams, Naomi Ackie, Joonas Suotamo, and Anthony Daniels. Even BB-8 rolled out along with his new friend D-0 who’ll be debuting in the much-anticipated new Star Wars film. Writer/director J.J. Abrams and producer Kathleen Kennedy also took part in the panel with fans, confirming this final film of the three trilogies will be the last Star Wars feature film for a while as Disney turns its attention to creating original content for its new streaming service, Disney+. 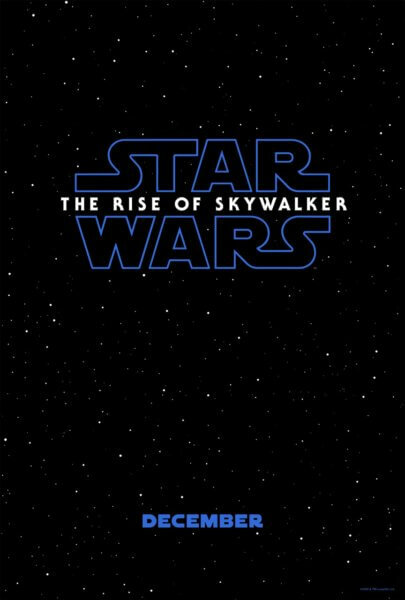 In addition to the title reveal and the teaser trailer, Disney and Lucasfilm released a teaser poster and photos from the Star Wars: The Rise of Skywalker. The cast also includes Adam Driver, Lupita Nyong’o, Domhnall Gleeson, Keri Russell, and Richard E. Grant. Mark Hamill and Anthony Daniels reprise their iconic roles, and Carrie Fisher will be featured in the film using footage shot but not used in The Force Awakens.